Published: Dec. 30, 2013 at 05:10 p.m. Updated: Dec. 30, 2013 at 05:33 p.m. In his final meeting with the media at Washington Redskins headquarters on Monday, Mike Shanahan discussed his dismissal from the team in a steady, almost casual, tone. The Redskins might have just paid him millions to go away, but the old coach looked no worse for the wear. 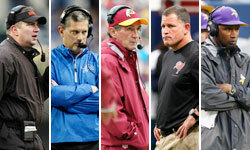 The same could not be said for Greg Schiano, who unconsciously became the face of Black Monday. Schiano took the unusual step of calling his own press conference at a local hotel, just hours after he was fired by the Tampa Bay Buccaneers after two playoff-free seasons. Schiano said he woke up this morning "fully focused" on a future he believed was still with the Bucs. The reality of this rejection was all over Schiano's face. "I'm proud of the culture we created here," he said. "On the field I think we're closer than people think." There would be no grenade throwing on his way out of town. Schiano thanked the fan base and organization and called Mark Dominik -- the general manager also purged Monday -- a "rising young star." He used "we" multiple times in reference to the Bucs, sounding like someone not ready to disconnect from a team that granted him access to the NFL coach fraternity. In short, Schiano looked and sounded the part of a humbled man. The sentiment sure seemed genuine, though calling your own press conference hours after getting fired was more than a little weird. Then again, being an NFL head coach isn't exactly the most normal of professions.